MANILA - The Department of Justice (DOJ) has found probable cause to charge suspected rice smuggler Davidson Bangayan and 5 others of conspiring to rig the bidding of rice imports to increase the market price of rice in 2014. 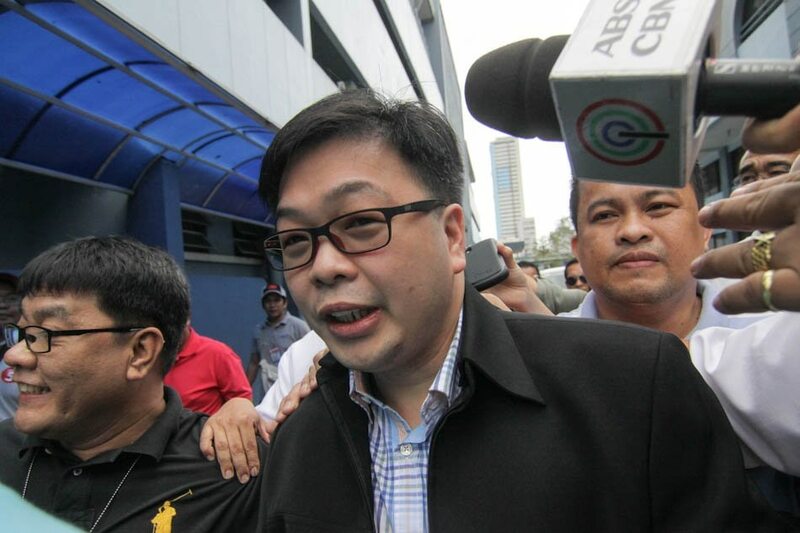 In a 14-page resolution dated Nov. 5 and released to the media only on Friday, Senior Deputy State Prosecutor Miguel Gudio Jr. affirmed the findings of the DOJ panel of prosecutors who found that Bangayan acted as financer of some cooperatives who took part in the bidding of rice imports. Bangayan was found to have worked with one Elizabeth Faustino, who facilitated the documentary and financial requirements of cooperatives Riverview MPC, Umasaka MPC, Sitio Muzon MPC, Sta. Cecilia MPC, Formosa MPC, and GPI San Miguel MPC. Meanwhile, in a separate transaction, one Eleanor Rodriguez was found to have acted as broker and facilitator of import requirements, Leah Echeveria as co-signatory of bank accounts opened for rice importations, and spouses David and Judilyne Lim as financers of cooperatives Kapatirang Takusa MPC, Ugnayang Magbubukid ng San Isidro Inc, Samahan ng Kapampangan at Katagalugan MPC and Samahan ng Magsasaka sa Kalawitan MPC. The Office of the Prosecutor General found that the cooperatives were merely used as dummies in the bidding in order to manipulate the price of rice in the market, in violation of Article 186, paragraph 3 of the Revised Penal Code. “The financial and technical support provided by the respondents to these farmers’ cooperatives, to the extent of undertaking all the processing of the governmental requirements and paying all the necessary expenses, as well as the fact that the cooperatives were required to assign their respective importations only to the respondents, clearly indicate respondents’ intention to use these entities as dummies with the end in view of monopolizing and manipulating the rice supply in the country,” the resolution said. The criminal offense carries with it a penalty of up to 12 years in prison and/or a fine of up to P6,000. The complaints against 9 other respondents for the same offense were dismissed because the National Bureau of Investigation failed to allege specific wrongful acts. Meanwhile, the Prosecutor General also found probable cause to charge Bangayan of unauthorized use of the name “David Tan,” in violation of Commonwealth Act No. 142. In the same breath, it dismissed the complaint for fictitious use of name because the use of “David Tan” was in conjunction with the use of his real name and it was not shown that he used the alias to mislead the public of his true identity. The unauthorized use of alias is punishable by up to 5 years imprisonment and a fine of up to P10,000. In the same resolution, the Prosecutor General absolved Bangayan and the other respondents of violating the Procurement Act because rice bidding through farmers' cooperatives is not considered a form of government procurement. Bangayan was the subject of a Senate inquiry in 2014 over an alleged rice cartel which manipulated the supply, and in turn, the price of rice in the market. The NBI submitted to the DOJ a copy of the Senate committee report. During the Senate probe, no less than then Davao City Mayor and now President Rodrigo Duterte testified that David Bangayan and David Tan were one person and the “go-to-guy” for rice smuggling. “If this guy would go to Davao and start to unload [smuggled rice] and I catch him, I will gladly kill him,” he said during the inquiry.